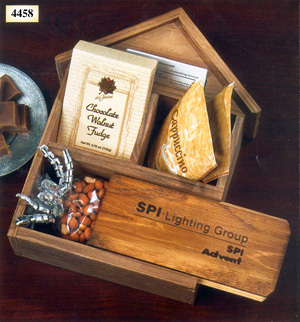 Beautifully crafted wooden desk piece holds two packets of Hazelnut Cappuccino, Chocolate Walnut Fudge, and an 8 oz. bag of Honey Roasted Peanuts. Perfect gift idea for builders, realtors, decorators, home health, or child care providers – you name it! There’s even a space for business cards. Shipping weight: 3 lbs. Measures: 11 3/4” x 7 3/4” x 3 1/2”. Case pack: 6. Prices shown per piece. Engraving area: 5” x 1 1/2”. This solid wood desk accessory makes a great thank you or recognition gift. 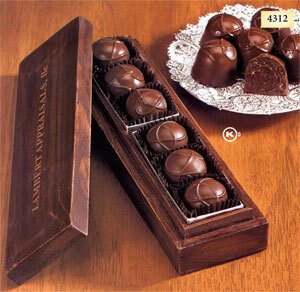 It comes with six of our extraordinary truffles (3.5 ounces). It can also be purchased empty. Either way, it is the perfect gift of good taste. Shipping weight: 1 lb. Measures 8 1/2” x 21/4 x 1 1/4”. Case pack: 12. Prices shown per piece. Engraving area: 4” x 3/4”. Blank or tastefully laser engraved, this beautiful felt-lined and hinged wooden box contains two 5 oz. 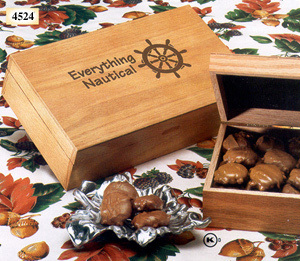 boxes of Chocolate Caramel Peanut Clusters. Shipping weight: 4 lbs. Measures 10 7/8” x 6 1/2” x 2 3/4”. Case pack: 12. Prices shown per piece. Engraving area: 6” x 4”.